Folds up for easy storage. Durable, lightweight anodized aluminum. Large, angled steps for climbing comfort. Anti-skid tread for safety. Easily attaches to dock with J-hook hardware (included). Stainless steel assembly hardware. 300 lb. capacity. 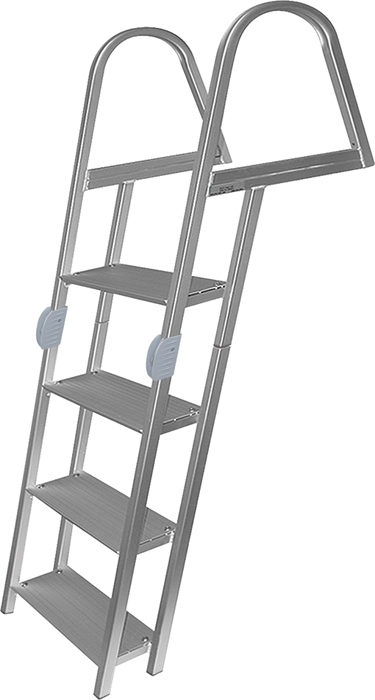 Width: 18", Step Height: 12", Step Depth: 5.25", Handle Depth: 15". the part about entering the discount code took 3 tries but other than that It was okay. The free sticker that comes with the product was damaged.